I snapped up one more pint of strawberries at the farmer’s market on Saturday, since I know the season will be over very soon. I haven’t had any luck getting Hoods this year, and the ones I bought this week were unlabeled, but judging by their dark coloring and only moderately sweet taste, I’d guess that they are Totems. 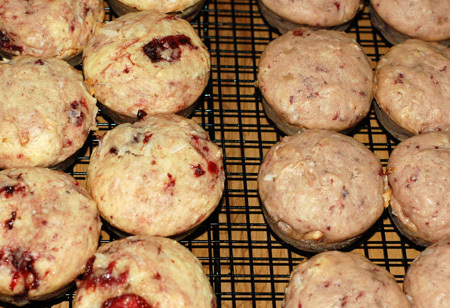 I also grabbed up a pint of Rainier cherries, which we have been eating out of hand, so I decided to use the strawberries in a different way, roasting them in the oven to concentrate their flavors and baking up a batch of strawberry-coconut muffins. I used a recipe from The Good Enough to Eat Breakfast Cookbook with some trepidation, since my track record with the zucchini bread from the same book is spotty enough. Sure enough, the batter came together looking more like cookie dough than muffin batter and yet I was supposed to be folding coconut, strawberries, and then beaten egg whites into it somehow. An extra quarter cup of milk made little difference, and I started considering my options. I chose to divide the batter in half, and finish part of it how my instincts were telling me, and the rest how the book described. For my own method, I just dumped the unbeaten egg white into the mixer with the batter, then gently stirred in the coconut and strawberries last. Eight muffins went into my silicone pan by the quarter-cupful, and while they baked, I dealt with the book’s instructions on the other half, stirring coconut and strawberries into the stiff batter, then attempting to fold in the whites, a laughable process that ended with deflated whites in a still stiff—but much pinker—batter. You can really see the difference in this photo. Both options yielded a dense and rather bland muffin, but the one on the left, in which I just dumped the egg white in with the batter and saved the strawberries for last, rose more and was visibly full of jammy chunks of strawberry. 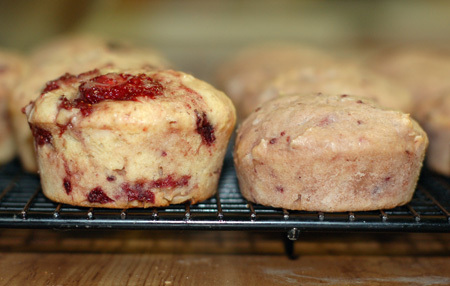 The muffin on the right, which should have gotten extra lift from beating the egg white, instead came out even flatter and denser, with an overall pinker color but only minuscule bits of strawberry thanks to the extra folding action. Needless to say, I won’t be including the recipe in this post. 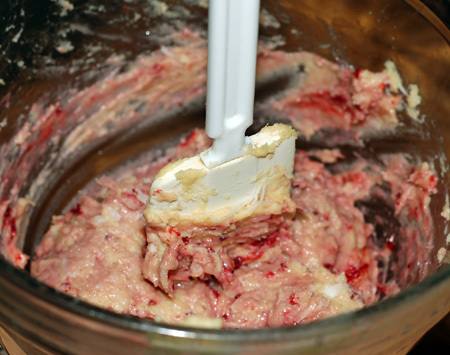 Any strawberry bread or muffins we make in the future will be coming from some other source, or heavily adapted. I’m thinking coconut milk would be a good place to start. I did appreciate the roasting technique, which concentrated the strawberries and prevented them from making soggy spots in the finished muffins; I’d use this technique again when including berries in baked goods, and may experiment with other fruits as the summer wears on. Preheat the oven to 400F, and butter a small casserole dish. In a bowl, toss the strawberries with sugar and balsamic vinegar or lemon juice. Spread out in the casserole dish, and roast for 45 minutes, until the strawberries have shrunk slightly and their juices have taken on a syrupy consistency. Note that you will end up with a cup or less of roasted berries. Cool to use in muffins, breads, or other baked goods, or serve warm over pound cake or leftover chocolate meringues, with a dollop of whipped cream. I do have to say, while clearly the baking recipes from the Good Enough To Eat cookbook have let you down a bit, there’s no place on earth I’d more highly recommend for breakfast. Oh, I agree (and seem to recall having suggested them to you in the first place). My basic pancake recipe comes from the book, and I happily wear my Good Enough to Eat apron every day. 🙂 I just think the baking recipes in the book could have benefitted from some test-cooking before publication.